Problem: Visual Studio and Unity Aren’t Playing Nice! Disclaimer: I develop on Windows, so I have no idea if any of this even applies to other operating systems. I assume not. Sorry. I just started poking around in Unity 4.6 and I’ve been having a blast. I’ve made it to the point where I want to actually start hammering out some code, but I came across a bit of a problem: I want to start leveraging other projects I’ve written in my Unity solution while I’m in Visual Studio, and things are blowing up. So, what gives? Okay, so let me start by explaining why I want to do this. I understand that if I’m making a simple game, I should have no problem breaking out my unity scripts into sub folders and organizing them to be nice and pretty. The problem I’m encountering is that I have existing projects under source control and I don’t want to copy and paste all of the code as scripts into my Unity folder. I also want to be able to create re-usable code for my future games, so I’d like to start breaking things out into libraries as I see fit. So, if you’ve been playing around in Unity for a bit, you might say “Oh, well you’re a dummy! 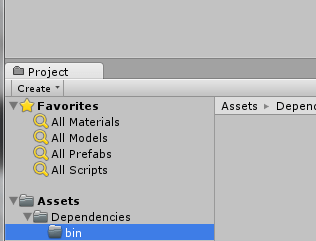 Unity can totally leverage your C# DLLs once you drop them into your asset folder”! And you’d be 100% correct. But that’s not the workflow I want. The underlying problem here is this: Unity will re-write your solution and project file when you flip between Unity and Visual Studio. But I’m sure they have it that way for a reason. The Goal: Visual Studio and Unity Should… Play Nice! Is this something that can be achieved though? I was pretty determined that I should be able to do *something* to have this working. Could I get it perfect? I wasn’t sure… But I knew I could make it better. 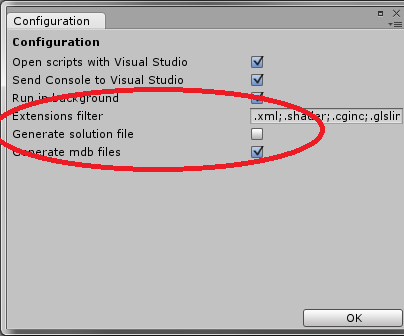 My *almost* perfect sution, which I’ll walk you through, is this: Leveraging Visual Studio tools for Unity, modify the Unity solution as you see fit and use directory junctions (symlinks) to the build output directories of other projects. 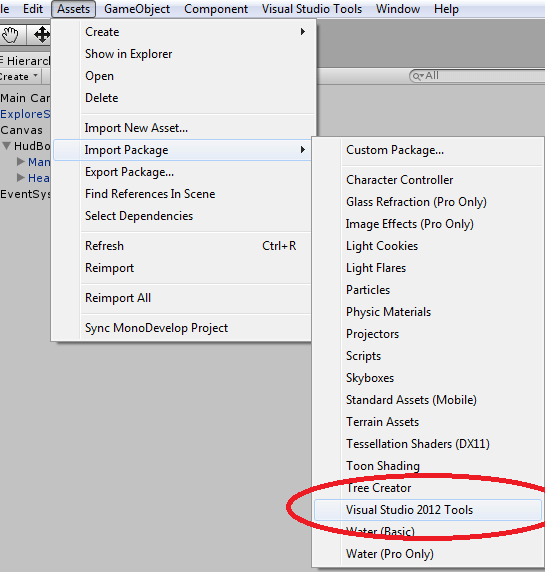 Let’s get Visual Studio tools for Unity installed. Visit that link and download the version that you need for the version of Visual Studio that you use. 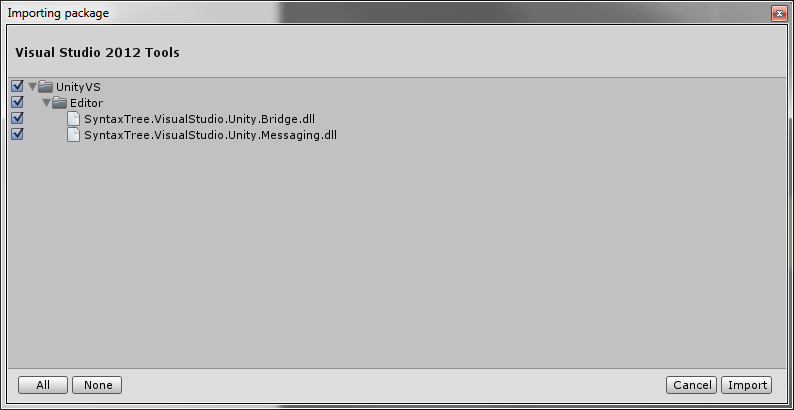 After installing, I opened up my project within Unity and I had to import the Visual Studio Tools package. Selecting “Configuration” opens up a really simple dialog. Let’s make sure “Generate solution file” is unchecked! It’s that easy. Once we have all of this setup, we should be able to go into Visual Studio and add other projects to our solution. The next part is probably the “trickiest” part because it’s… well… unusual. You could technically stop here and manually copy DLLs back and forth, but I’m not about that life. I want things to happen automatically. For this, we’re going to use junction points. Browse to your newly created folder in an administrator command prompt. I say administrator because only certain users have permissions to create junction points. Your non-admin user might, but this is my “safe” way of instructing you. On the command prompt, we’re going to use “mklink” to create a junction. The command is “mlkink /D /J <NAME_OF_YOUR_PROJECT> <RELATIVE_PATH_TO_YOUR_PROJECT>”. For example, if you had a C# project you wanted to reference that was “MyCoolLibrary.csproj” and was located in the directory above your Unity project, you might use the command “mlkink /D /J MyCoolLibrary “……..MyCoolLibrarybindebug””. Note that I used two dots to go back up a directory several times (since we’re inside of AssetsDependenciesbin and want to get outside of our Unity project). you should get a success message when your junction is created. Repeat this step for as many extra projects as you want to include. You can always come back and add more projects this way too, or remove the junctions if you don’t want to include a project anymore. At this point, you’re technically done. If you build from Visual Studio, you should have your other projects’ DLLs end up in your Unity folder, and your main game project will be updated by Unity to reference these now! But… You’re not done if you use source control for your Unity project and have separate source control on your other projects. The scary thing here is that usually we don’t want our build outputs to be stored in source control… But if we do nothing else, your source control system will likely want to include the newly created “AssetsDependenciesbin” folder and any of the contents you’re building into there. I just modified my git ignore file (I’m sure there’s an equivalent for SVN or other source control) to exclude the contents of “AssetsDependenciesbin”.The reason I didn’t excluded dependencies all together is because I can add other folders and DLL references here that I don’t want to build (like… the normal way). This gives me the flexibility of building the projects I want to control and still be able to just reference other pre-built DLLs! In three easy steps, you should be able to use Unity, Visual Studio, and multiple projects in one solution in a what-feels-like-normal way. Because there’s still some dynamic stuff going on with Unity updating your main project, you might find the odd time you need to build twice to fix up compilation problems. I’ve seen this happen maybe once or twice so far, but otherwise it feels like normal. It’s also important to note that you can’t escape the Unity project updating… don’t add references to your main project manually. That’s what that “AssetsDependencies” folder is for that we made. Unity gets mad at you for using junctions within your project. It actually tells you not to do this because you can mess things up. It’s working awesome for me right now though… So I’m going to just ignore this warning. Remember step 3 where we ignored the AssetsDependenciesbin location in git? This actually ignored your junction points you created too. As a result, anyone else who clones your code will need to create junctions too. I’m working solo, so I’m not too worried about this step… But it’s definitely something that should be fixed up (again, I’m sure it’s doable, but I’m in no rush). Hope that helps you feel more at home in Unity and Visual Studio! It certainly made it nicer for me.